Timeless or trendy? That’s the question I’m asking myself from behind the wheel of the Audi S5, a sleek sports coupe that’s been totally redesigned for 2018. On the one hand, this car is a monument to contemporary style, a rolling Museum of Modern Art. Its squinty LED headlights, neatly pressed body creases and acres of digital screens in the cabin make it a vehicle that’s clearly designed for this fleeting moment in time. That makes the case for the S5 being a trendy blip, a car that will look “so 2018” a couple of years from now when surely Audi will offer a new-and-improved version for people fortunate enough to upgrade their cars as readily as their wardrobes. Today’s Audis are nothing if not large, mobile fashion accessories. Take another look, though, and it also makes the case that this is a vehicle for the ages. It takes some cues from two-door cars that never seem to wither, like the long hood of the Jaguar E-Type or the muscular grace of a Mercedes SL. It’s lower, wider and cleaner now, all things that will help it turn heads when it crosses the Barrett-Jackson auction block in a few decades. An all-new design for the Audi A5 and S5 makes it a contemporary masterpiece. It wraps fresh technology in clean, timeless lines. Aside from its design statement — this car’s most noteworthy selling point — there are two more reasons premium buyers should take a look at it: performance and technology. 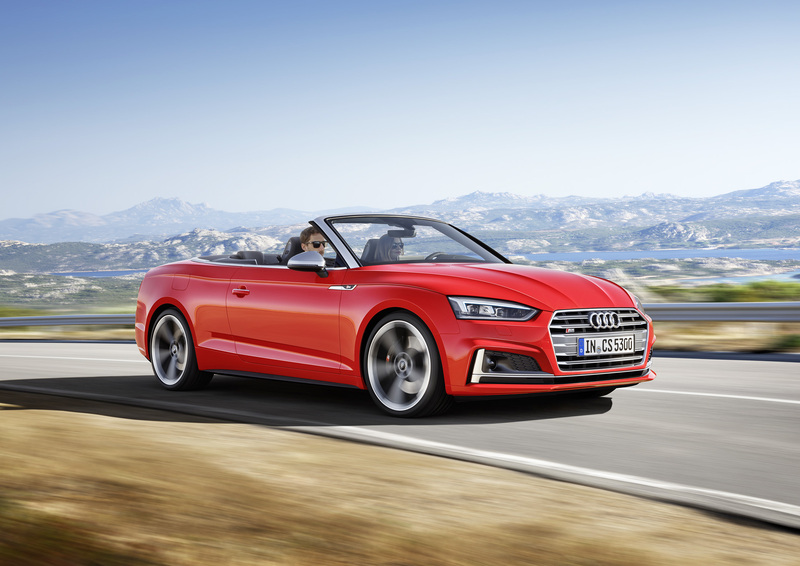 While the basic A5 is no slouch with a turbocharged 2.0-liter, four-cylinder engine that makes 252 horsepower, the performance-boosted S5 convertible I tested is a different animal. It features a golden-throated V6 that routes 354 horsepower through an all-wheel-drive system that makes it stick to pavement like Super Glue. The result is a car that can reach 60 mph from a standstill in just 4.4 seconds and turn corners with awe-inspiring speed. I wouldn’t call it a track-day car, but you definitely need track access to explore its performance envelope. It’s also got a cabin that feels like it came from the future. That real-life science-fiction feeling is reinforced with Audi’s “virtual cockpit” display behind the steering wheel. This screen alone has tech specs that read like a high-end gaming system, including a quad-core NVIDIA processor driving its foot-wide display that delivers gorgeous, vivid color and refreshes at 60 frames per second — twice the speed of regular televisions. It uses large images from Google Earth to enhance the navigation experience like no other car I’ve tested. Audi’s virtual cockpit display is the most sophisticated looking digital dashboard on the market today, using images from Google Earth to enhance its navigation experience. A full-color heads-up display, touchpad that can recognize your handwriting, excellent smartphone integration from Apple and Google, and breathtaking 755-watt Bang & Olufsen sound system round out the “impress your friends” list. The streamlined design of the dash compliments all the technology nicely, essentially creating a movie set where all the digital action can take place on a stage of carefully positioned screens and knobs. Aluminum and optional carbon trim in the S5 make it feel more futuristic than the warmer, more traditional A5’s cabin. Pricing, as you can probably guess on a German luxury car, isn’t for penny pinchers. The A5 starts at $42,800 for the base Premium trim, $45,800 for the mid-grade Premium Plus and $50,400 for Prestige. The powerful S5 coupe starts at $54,600 before you add any options. The drop-top S5 cabriolet starts at $62,300, and upgrades vaulted the price of my tester over the $70,000 mark. It’s as impressive to look at as it is to drive. It combines sleek, eye-catching design, muscular performance and leading-edge luxury features in the cabin.